Last month, when flames raced across vast stretches of northern California, destroying lives and property, much of the media focus was on the devastation that it caused for the wine industry. Not as much attention was given to the vibrant, working-class Latino communities that had their lives and their livelihoods disrupted by the conflagration. 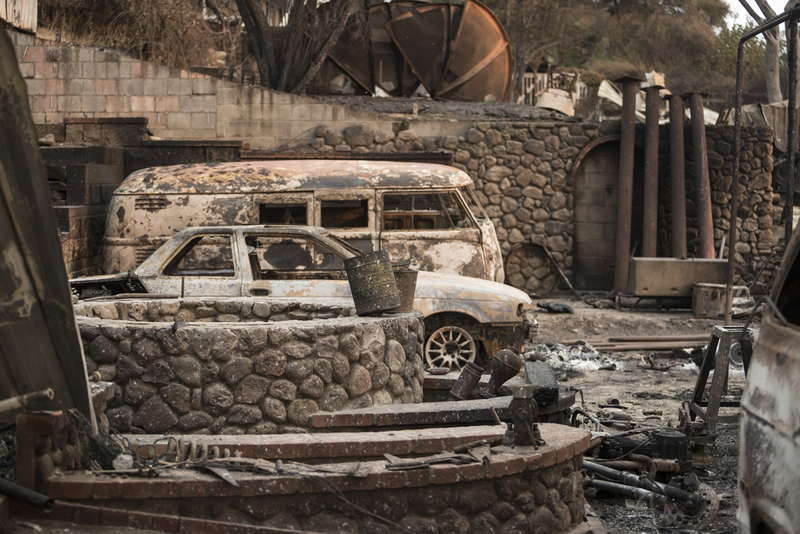 Even weeks later, with the fires nearly 100 percent contained, families are still dealing with the fallout of the deadliest fires in the state's history, trying to figure out what the future holds amidst job loss and displacement. News reports frequently refer to the area as "wine country," and many might imagine wealthy retirees or vineyard owners, but "wine country" encompasses a pretty diverse population. The area's Latino population has surged in recent years to nearly 27 percent of Sonoma County and 34 percent of Napa County, according to the United States Census. These communities often look to local Latino foundations, and that's where the Latino Community Foundation of California steps in. The largest network of Latino philanthropists in the country, the LCF bolsters Latino-led nonprofits and encourages Latino political participation. Though Latinos are the largest racial minority in the United States, Latino nonprofits only receive 1 percent of philanthropic dollars. The LCF helps to close that gap by investing millions in education, health and economic opportunities for Latino communities. Masha Chernyak, the foundation's vice president of programming, told Inside Philanthropy that the LCF exists to "invest in these institutions and elevate them to a different level." "Latino nonprofits are so important because that's the place where our families go, they're the trusted anchor institutions. These are the places that are hubs of information and resources. These are also the places that educate our community and help them find their political grounding." During and after the wildfires, the LCF quickly mobilized and launched a fund to support Latino nonprofits in the hardest hit areas. The NorthCal Wildfire Relief Fund aims to advance the relief work of three regional organizations, North Bay Organizing Project, UpValley Family Centers and La Luz Center. All three of the NorCal nonprofits target farmworker families, the community most impacted by the fires and in need of more assistance when it comes to rebuilding and recovery. The LCF believes these community organizations or nonprofits should lead the solutions in the affected regions and "trusts they know what to do in the immediate and long term." These immigrant populations are more vulnerable to homelessness after wildfires, as some of them are undocumented and therefore don't qualify for federal aid like FEMA assistance, unemployment benefits or welfare. Despite promises from Senator Kamala Harris that ICE would suspend immigration enforcement in California during the wildfires, a fear of being arrested makes undocumented workers wary even of homeless shelters or mainstream white philanthropies that could provide emergency assistance. These same farmworkers that live a precarious paycheck-to-paycheck existence are also indispensable to the economy of the region. Latinos make up 71 percent of the workforce at vineyards and similar agro-businesses, and they're 40 percent of hospitality workers in the region. Now, many of them are without jobs temporarily as vineyards are shuttered and possibly permanently displaced, as the wildfires only exacerbated the affordable housing shortage in the region. Many of the immigrant families in the region simply aren't economically prepared for this type of disaster. "What the wildfires are bringing to light is that very few of these working-class Latino families have savings accounts or money to tap into in order to deal with this emergency. The wages they live on aren't living wages," says Chernyak. As of last week, the Latino Community Foundation has raised $300,000; the average donation is just $110. The organization's ultimate goal is a half-million. Says Chernyak, "We're overwhelmed by the outpouring of support, especially from regular individuals from all different backgrounds. We feel energized and motivated to keep moving forward through this crisis."